Where are the friends of my youth? say, where are those cherished ones gone? And why have they dropp'd with the leaf? ah! why have they left me to mourn? And the world is a wilderness drear; as a wide-spreading desert it seems. Ah! 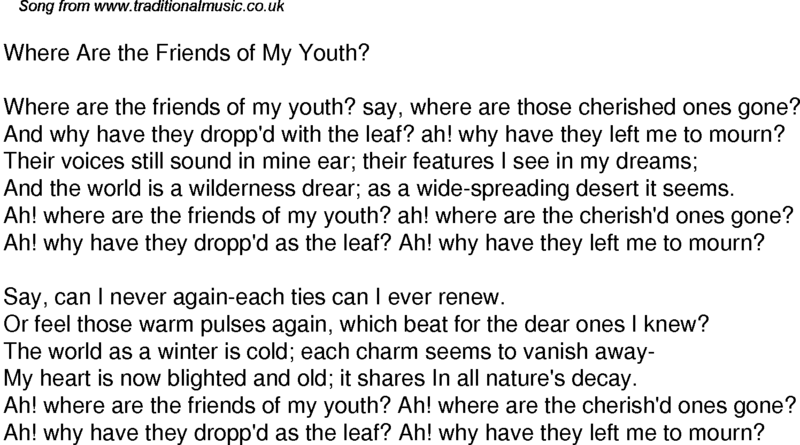 where are the friends of my youth? ah! where are the cherish'd ones gone? Ah! why have they dropp'd as the leaf? Ah! why have they left me to mourn? Say, can I never again-each ties can I ever renew. Or feel those warm pulses again, which beat for the dear ones I knew? My heart is now blighted and old; it shares In all nature's decay.